ig is an insignificant insect in a world with no humans. Insects of all kinds – winged, segmented, as well as six-legged and eight-legged creatures, to many more legs, dominate this new world. The insects band together to create an organized world in a wide tree trunk. 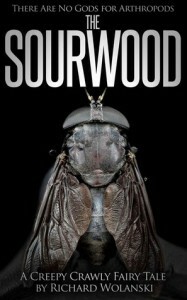 This impenetrable wooden fortress, called the Sourwood, is their home. Though the story is told from Fig’s point of view, a mite as small as the seed of a strawberry, it doesn’t read like a children’s book. However, I found it difficult to connect with Fig, his friend, an eight-spotted flea beetle, Oz, or any other character. Not because they are two-dimensional, but because they are not human or at least an animal that we tend to associate with having human emotions. In the story, Fig must decide his fate for the remainder of his short life. I understand that the author sets the mood to steer the reader into thought-provoking questions about life and one’s station in life; however, because the point of view is from an insect, this book just wasn’t for me.